Dennis White, Mike Adair and Chad Meyer receive the 2018 George W. Burke, Jr. Facility Safety Award from WEF Board Representative, Peter Vanrolleghem. PeopleService was honored with the George W. Burke, Jr. 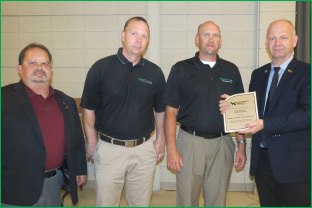 Facility Safety Award by the Iowa Water Environment Association on June 6, in Waterloo, Iowa. In attendance were PeopleService President Chad Meyer, Region Manager Dennis White and Director of Operational Programs Mike Adair. The award recognizes a municipal or industrial wastewater facility for establishing and maintaining an active and effective safety program. The documented and illustrated safety program and safety record of the facility for the preceding calendar year are the primary criteria for the award. Dennis White and Mike Adair delivered the award-winning safety presentation on Elkader, Iowa, to representatives of the Water Environment Federation. “PeopleService’s safety program is truly second-to-none. It’s an honor to see our program recognized for its merits,” said Dennis White. The award was established in 1982 in honor of George W. Burke, Jr., for his many years of service to both the water environment field and WEF as staff manager of technical services. Mr. Burke was instrumental in developing WEF’s annual safety survey and assisting in the production of several safety training aids and promotional packets. To learn more about all that PeopleService does to help their partner communities’ water/wastewater stay safe, contact Chad Meyer.